I am honored to be featured on Writers And Authors today! 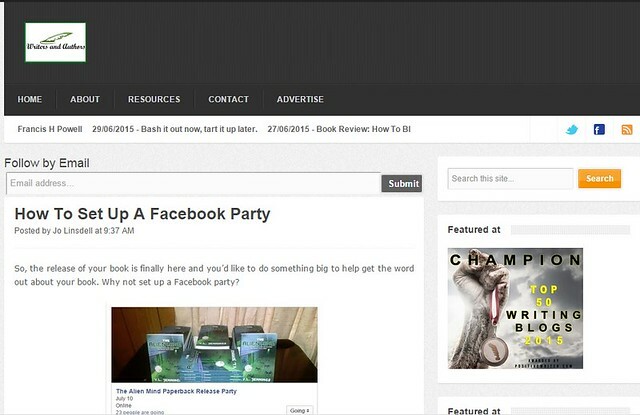 Have you ever wanted to set up a Facebook party to release your book but you weren't sure how? Maybe you want to have a party to celebrate a special mile stone? Come on over to Writers&Authors and I will be happy to tell you how to do it! I've even included some game ideas to help you get started! *Tomorrow, I'll be at Frampton Plantation at 1 Low Country Ln, Yemassee, SC 29945 from 8 till closing time signing copies of The Alien Mind! I'd love to see you there! And... as a side note... This is also my 100th post on my blog! YAHOO!